Hey everyone, I'm working on an Earth Defence Force "de-make" for VOGJam (hope that's ok Bobby - I'll be using all original assets and probably avoid the title "Earth Defence Force" for the final thing). I've never made a game before, but as a web developer I'm finding PixelJS fairly easy to get to grips with. So far I have a player character who walks around and, erm, that's it. No screenshots to show yet. Maybe something in the coming days. Good luck with your project can't wait to see it-- you know, even though your working title might be inspired by a classic video game series, maybe another name will come to you as you work on it. De-make is okay, as long as there aren't any references to the title. The title is indeed trademarked and can't be used. Good luck! Great! If it's even half as fun as Assasseed's Crin, I'll consider it a roaring success. I spent some time today working on the sprites, so I finally have a screenshot to show off! 11 hours to go... the bugs now have normal walking patterns, and I have a level system. Although I've at this point ruled out health or score systems. I better get on with it! I've just sent off my submission email, so time to share the finished(?) game with the world. Looks great! I find it amazing that you were able to learn how to use an engine so quickly! I'm jelly, i'm such a slow poke. Wow, this game is tough! The game runs nice and fast on my machine even with the absurd amount of enemies on stages 5 and 6, though reloading the page every time I get killed really shows things down. 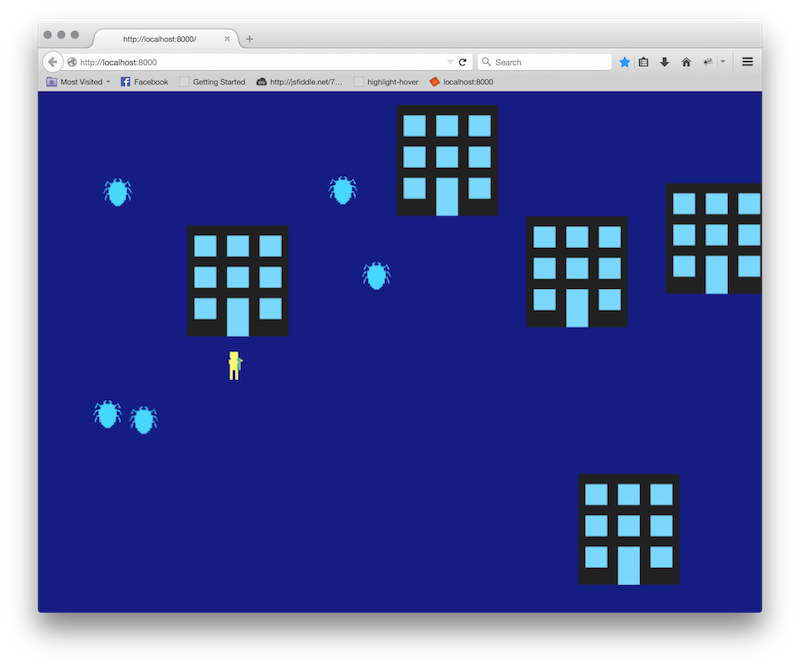 I ought to try PixelJS with my next HTML5 game. Good job! Edit: You ought to add gamepad support to this using Google Chrome's Gamepad API. It'll make the button mashing feel better. Last edited by hitstun on Thu Jan 15, 2015 4:58 pm, edited 1 time in total. Thanks both! Not sure if I'd recommend pixelJS so quickly. It kept a high frame rate even with all those bugs onscreen, and has a very shallow learnin pg curve. But I couldn't get it to spawn entities (ie. Enemies, bullets) mid-level, or even clear between levels (hence the reloading of the level each time). And since basically no one has ever used it, there wasn't much I could rely on outside of the (admittedly very good) documentation.